Recently I had watched a great video which compelled me to write this article about an incredibly inspirational life story of an illiterate woman. 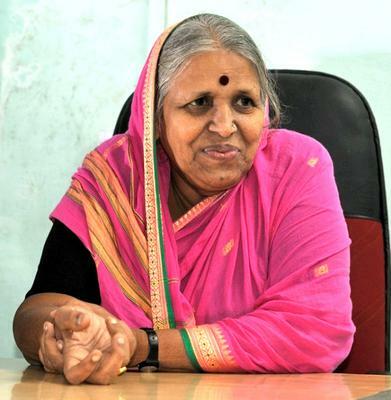 Meet Sindhutai Sapkal, an extraordinary woman of India, who is affectionately called "Mother of Orphans". She is a social worker and social activist, and her story is all about love, compassion and devotion and till now she has adopted and nurtured over 1,400 orphans. She made her adversities into achievements and had won many awards including Doctorate of Literature. Let us learn more about her. Sixty-nine years ago, a baby girl was born in a village of Wardha in Maharashtra State. Her father was cowherd by profession. Her parents were not happy with her birth, and she was called 'Chindi' in Marathi, which means 'torn piece of cloth.' She was highly interested in going to school and study, but she was not allowed to study. However, much against her mother's wish, her father sent her to the government school till 4th standard. Her parents got her married off when she was still a child, at the age of 10, to a man who is much older to her. Thus her early marriage put an end to her studies. Her 30-year-old husband was illiterate, a cowherd from another village. Within ten years of abusive marriage, she gave birth to two sons. She had to cut the umbilical cord of her newborn baby from her body with a sharp-edged stone as there was no one to help her. Carrying her baby in hand, she walked to her mother's home hoping to get shelter there at this stage, but to her utter shock, her mother refused to accept her to her house. Disappointed, she took shelter in the cemetery where she felt secure from the evil eyes of greedy men, in the night. When she was hungry, she saw a funeral pyre in the cemetery, and she cooked her food on that fire. Frustrated with her unfortunate life, she decided to put an end to it by committing suicide. As she was hungry, she was begging for food in the railway station where she met other orphan kids struggling for survival. She heard a man's cry for a few drops of water just before his death, but no one minded him and walked away from his side. She approached him with the roti left in her hand and told him to eat the roti and drink water and then die. Surprisingly, after eating that food, he didn't die, which made her happy. That incident changed her thought of committing suicide and determined to live for the orphans. She adopted the orphan kids she met, as her own. Day by day the number increased and her family became big, and she became a mother to all of them. She began to sing in the railway platforms for food to feed all her children. Soon it became the mission of her life to give love and care for the abandoned children. She even donated her own daughter to avoid any partiality among her children. Over the years, her family consists of 282 sons-in-law, 59 daughters-in-law, and over 1000 grandchildren. Sindhutai is proud that many of her children have excelled in life and even become lawyers, doctors, teachers and nurses. “Hunger made me speak, and this became my source of income,” says Sindhutai. Her own daughter Mamata also has joined her mission. Sindhutai Sapkal is a great orator and gives great talks and earns money for the needs of her large family. She built the first home in 1991 in Saswad, Pune. Bit by bit she collected money and built four more ashrams for her children, without any Government aid. Apart from the talks she gives across the State, she runs her large family with the help from well wishers in terms of cash. Her grown-up children also help run the place and look after the daily needs of the children who live here. Amazingly, after many years of abandoning her from her marital home, her 80-year-old husband came back to her and apologised for his cruel deeds. This Mother of Orphans forgave him and accepted him as her child, and she introduces him to others as her eldest child!! Sindhutai has won over 750 awards for her work and has recently been conferred a PhD by a college in Pune. There’s also a film in Marathi on her life and struggles called ‘Mee Sindhutai Sapkal’. The film was selected for world premiere at the 54th London Film Festival. “I am there for all those who have no one,” she says with a lot of affection, which speaks of her greatness. Apart from these underprivileged children, she also takes care of an army of cows. If you are interested to know more about this amazing woman a google search on her name will bring out umpteen videos and articles. Sindhutai Sapkal is another example to the world that anyone with a determination, even with no money and degree certificates, can make a difference in the world. How to send a fund to sindhutai organization?Kindly mention a phone number or address of sindhutai organization!